Have friends in Toronto? Announcing WitnessTO! The Witness 2.0 family of blogs is so proud to announce the launch of WitnessTO.com on January 30, 2012. Every day during the week of Jan 30 – Feb 5, WitnessTO will be posting a testimony from their editors, so be sure to tune in to their blog! More info on the official Facebook Event here. 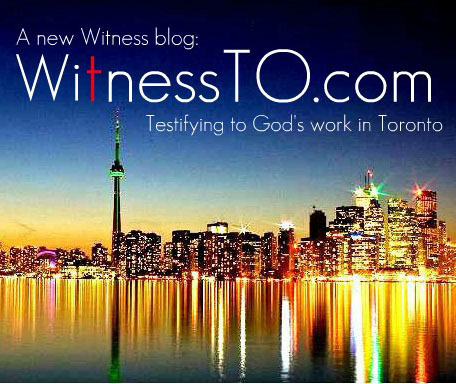 If you know people in Toronto who need encouragement or have friends who are interested in getting involved in sharing their testimony or editing for the blog, pass the word on! It’s as easy as clicking “Like” or sharing the link on Facebook! WitnessTO will be the 4th addition to the Witness family, the first three being WitnessLA, WitnessHK and WitnessSF. If you have any thoughts, comments or encouraging words, feel free to leave them here, or get to the WitnessTO site and leave them there!